Strictly Writing: Time For a Cuppa? Thank you - I'd forgotten it was today. Give me half an hour to shower and get dressed, and I'll be there. Hilariously, Pip forgot to take the cookies to school. I shall be eating striped hearts all bloody week. A great cause - please support Macmillan everyone! 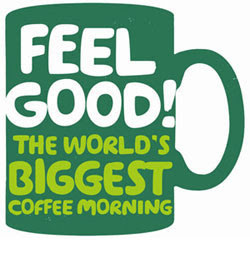 Charity fund raising events such as Macmillan Coffee Morning can benefit a lot of people but what touches me the most is the fact that your daughter gently nudge you into it. More than just reaching out to those who are less fortunate, what is integrated into a child is that kindness of being 'noblesse oblige'.